The Albula & Landwater Railway was founded in 1993 as a division of the the Westoenner Kleinbahn , which is my modelrailroad in european metergauge = On39 3/8. The reason for founding the A&L was, that I learned during my vacation, how cheap - for an german modelrailroader in On39 3/8, Switerzland prototype - american narrow gauge in O-scale is. For my layout is only less material available, and rolling stock can only be bought as RTR-models in limity quantity. This models are very expensive, and can often only be used for collecting, not for operating an modelrailroad-layout. For the price of three 4-wheel-boxcars - Rhaetian Railroad prototype - I'm able to get ten D&RGW boxcars 3000 series, one caboose, and an 2-8-0 brass engine RTR. Also, there are many parts and kits available, and I can get kits for scratchbuilding my own material. So, modelling in On3 Colorado prototype is much easier than in On39 3/8 Switzerland prototype. Since this day, I got some steam-engines and built up some freight-cars. Also, I started converting an On39 3/8 module-station to On3, but in the meantime I found, that the trackplan is not very good. So I plan to remove all the track and use this modules for a new station. 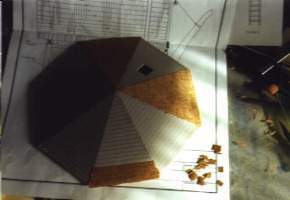 My first modelproject for my On3-layout was a 50,000 gal. 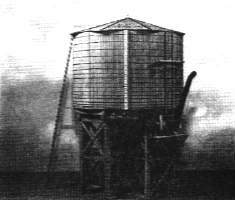 watetank. I used an Gloor Craft-kit for this model, but changed many things to convert this standard-gauge-prototype for narrow-gauge. I shortened the legs of the tank to make the whole assembly lower, built a complete new roof and also scratchbuilt the spout-hanger-assembly. 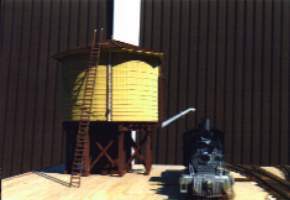 For informations about narrowgauge watertanks I used old issues of the Narrow Gauge and Shortline Gazette and searched the Cumbres & Toltec Multimedia Adventure Kit of Sandia Software for more informations and drawings. 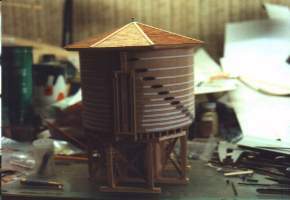 Bot was helpful, but without the informations of other modelrailroaders the tank would never be finished. 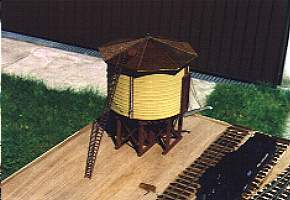 The most help I got from Lex Parker from Canada, who sent me many informations about the watertank by email. He is a very good friend. As promised, I've added some more photos about my watertank. The next to do is the weathering-job, wich will be handled by my friend Georg Wolter. In november 1997, my friend George and I decided, to participate the Convention for American Railroadfans in Switzerland. For this convention, we are building on three modules the station "Albula Summit". For this modules, we will use together with other buildings the above watertank.